Glucose and dextrose are both simple sugars or monosaccharides. The words "glucose" and "dextrose" are often used interchangeably. There is a difference between glucose and dextrose, however. Glucose is present in nature in two different molecular arrangements known as isomers. The isomers of glucose contain the same molecules, but they are in two different arrangements that mirror each other -- much like how your hands mirror each other. The two isomers of glucose are named L-glucose and D-glucose. Dextrose is D-glucose and may be referred to as dextrose or glucose because dextrose is actually a form of glucose. 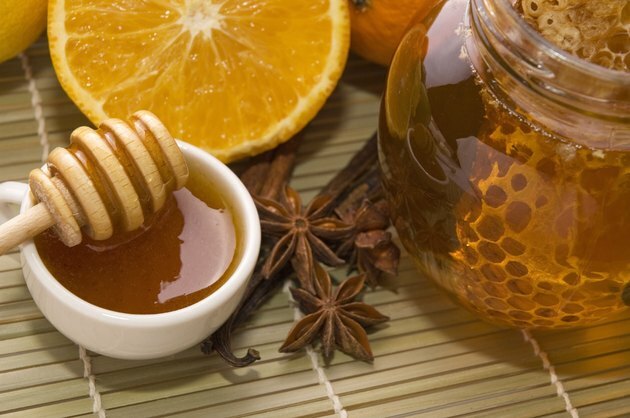 Dextrose or D-glucose is the form of glucose found naturally in foods such as fruit and honey. It is also derived from plants, like corn, for use as a sweetener in foods. According to the Sugar Association, dextrose is crystalline glucose, and a majority of dextrose in foods is derived from cornstarch. If dextrose has been added to a food, it may be listed on the ingredients list as "rice sugar," "wheat sugar" or "corn sugar," depending on the plant source. Manufacturers may also list added dextrose or glucose as "glucose," "dextrose" or other terms containing the word "glucose" or "dextrose." Dextrose is added to many foods including desserts like cake mixes, cookies, custards and sherbets as well as in snack foods like crackers and pretzels. Dextrose is also the form of glucose in your blood. It is used as the principal form of energy from carbohydrates in your body. When people talk about the dextrose in your blood, they may refer to it as blood sugar or blood glucose. In the medical field, dextrose or glucose is also used to describe intravenous fluid, oral tablets or the liquid to be given to patients to raise their blood sugar or supply calories. Researchers from a company supported by NASA found that L-glucose and D-glucose taste exactly the same, but only D-glucose is metabolized by your stomach and used for energy. For this reason, L-glucose was considered for use as a low-calorie sweetener, and more research was conducted. It turned out that L-glucose was too expensive to produce for this use, however. Academy of Nutrition and Dietetics: How Can I Tell If Foods Have Added Sugar?